Friona, TX is ranching country. As with much of Texas, Friona’s identity is intimately tied to the color and texture of the land it occupies. Serving Friona since 1945, Parmer Medical Center sought a replacement facility that would speak to its established roots in the community. Health Facilities Group helped realize this goal by drawing inspiration from the rugged beauty of the region’s ranching landscapes. By utilizing exposed steel and rust-colored metal, HFG delivered a hospital that felt authentic to its unique community. 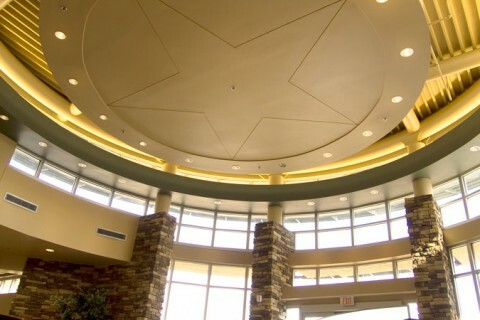 As a final touch, a Texas Lone Star spans the 35-foot ceiling of the lobby rotunda in order to tap further into local identity. As Parmer Medical Center shows, every project is an opportunity to create custom-designed reflections of community identity. From rustic to urban architecture, HFG has the design palate to capture any portrait. Parmer Medical Center houses an emergency department, digital imaging suites, laboratory, physical and occupational therapy areas, and 25 patient beds. Designing this 37,000 SF replacement facility involved keeping the hospital operational while building within 12 inches of the original facility. This extremely tight fit meant coordinating complicated construction logistics and managing cooperative relationships with the hospital staff. For instance, the entry vestibule could only be constructed once demolition of the old structure was complete. This necessitated the use of a temporary entrance that would not diminish the functionality of the hospital. By choreographing creative solutions to physical constraints, HFG achieved the desired design outcome.